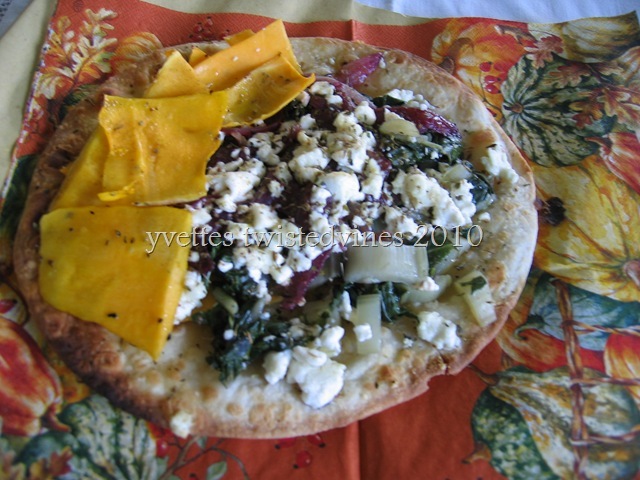 This pita bread pizza has contrasting tastes the sweetness of pumpkin combined with the intensity of the mild aroma of red torpedo Tropea onion. 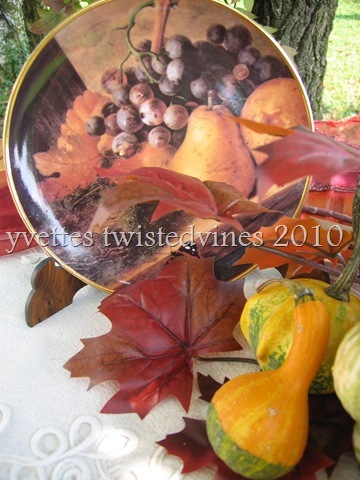 An Autumn seasonal delight. Sweet Red Onions Of Tropea One of Italy’s prized onions, it’s super sweet, and has the added bonus ,the lowest lacrimal factor, the onion which dose not make you cry.A great bonus, don’t you think, slicing onions without burning eye’s. It’s grown in region of Calabria, Italy , along the coastline between Capo Vaticano and Vibo Valentia. It has a slightly elongated shape and a deep red, wine color. The onion itself is not only famous in Italy, but is known all over Europe for its unusually sweet and mild flavor. Pita breads are so versatile I find them a great success and lighter than a pizza base.Heat up the grill on your oven.Quantity here depends on how many pita bread pizza’s you’re making, I thought it be easier if I work on one and you’ll be able to double it accordingly. 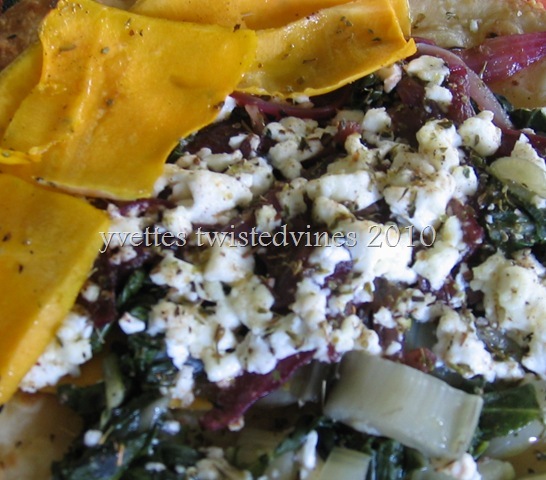 Slice thin pumpkin slices, drizzle with olive oil ,dried oregano and thyme, a sprinkling of nutmeg and place under grill. After a few minutes cooking time,put aside. Meanwhile steam a bunch of silver beet or spinach. Drain,and while still hot add 20g of feta cheese,salt,pepper and a sprinkle of nutmeg. Place a tablespoon olive oil in frying pan,add a crushed garlic clove and sliced tropea onion, and fry until onion is transparent, add a drop of water and a teaspoon of balsamic vinegar, to finish. Line an oven tray with oven proof paper,place pita bread,a drizzle of olive oil and dried oregano and place under grill, cooking time..a blink! 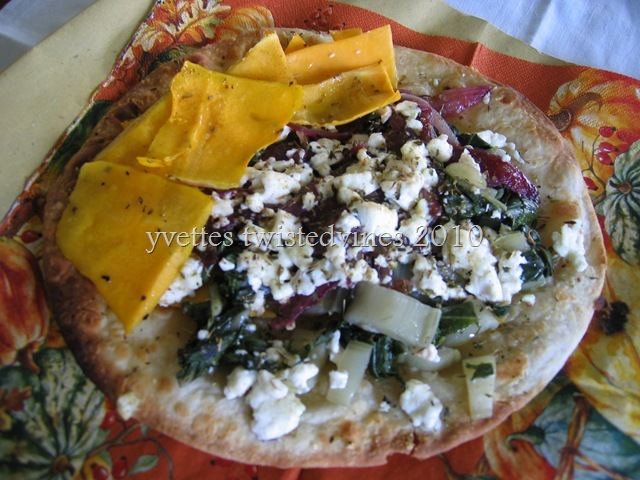 Time for the fun, turn pita bread over and begin adding your fillings. Pumpkin,silver beet. feta cheese mix,onion and the final 10g of feta cheese crumble on top. Drizzle with olive oil, place under grill for 3 minutes…two blinks..and it’s done! Wow! I think this is the most interesting pizza recipe that I have ever seen! 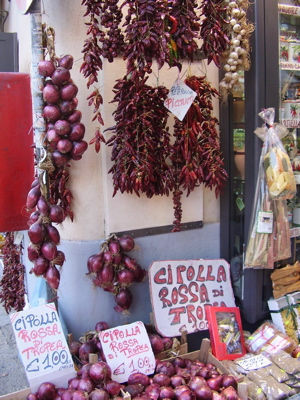 I’ve never heard of a tropea onion- and now you have me salivating over one! Amazing pictures! Thanks for calling by…I use these onions more than white or brown, great for salads, and stew,made in chutneys and jams. In Calabria they even make ice-cream with this flavour.Interesting…I’ve yet to try the ice-cream! Very different kind of pizza. I enjoy feta cheese on salads. I like pita bread, too. Sounds like a winner, Yvette. I see purple onions in our markets, but I doubt I’ve ever seen a real Tropea onion. I am sure they are delicious! Thank you for sharing. Tropea onions are the best onions….given good on the grill. Wow, now that’s a pizza! A little different I agree…but wonderful fall colours and great tasting!…Thanks for calling by! *drool* I can almost taste this, and your photos look like paintings! Thanks Cindy…went for the healthy veggie treat with this one! Tasty and healthy! what beautiful photos! They make me hungry! Thanks for stopping by What’s Cooking Wednesday! Hope you link up with us again next week! Thanks for calling by…look forward to it! Be interesting if you can maybe you can find them in the more specialized gourmet deli!What a treat if your could grow your own! That pizza is a work of art and so different from any pizza I have ever seen before. I definitely need to try this one…wish I had some of those delicious-looking onions to go on it! Delicious they are, baked Tropea onions are a real treat!